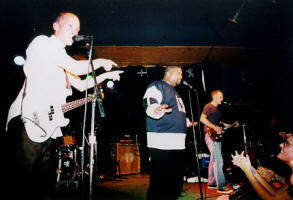 Chris Ballew and Outtasite later formed The Feelings Hijackers (aka TFH). 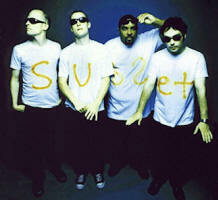 TFH also re-recorded handful of Subset tracks. Addicted To Fame (version 1) Unreleased studio track ? Appeared in 2009 on Dave Dederer's MySpace page. Different version than what was released on Jupiter/Addicted To Fame 12” promo single. Addicted To Fame (version 2) Jupiter/Addicted To Fame 12” 2000 Only track that was officially released (on Jupiter/Addicted To Fame 12”), before Subset broke up. 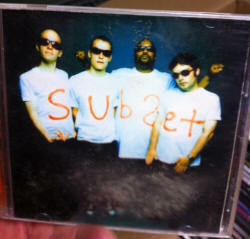 No info if SUbSET ever recorded a studio version. Cruisin' Unreleased live track ? Studio version? Girl U Want Unreleased live track ? Studio version? Devo cover. Original version by Devo can be found at their 1980 release Freedom Of Choice. Movie Clip Unreleased live track ? Studio version? Loans the main riff from ZZ Top's La Grande. No studio version is know to circulate. 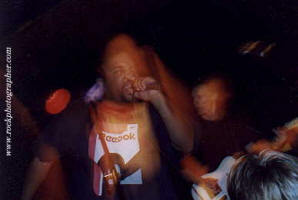 Outtaside released his own version later on his album Right Side Down (CD version). "The Movie Clip was originally a song I had recorded with Mix-a-lot shorty before Subset. During rehearsal early on, we were looking for some songs to throw in the live set. Out of nowhere PUSA started jammin the ZZ-top riff, and I started reciting the words to Movie Clip…. Mix began chiming in on the chorus….. and that became the “Subset version” I still perform that version of the song with my band till this day…….. Good times." She Wants You Unreleased live track ? Studio version? Skinnin' And Grinnin' Unreleased live track 1998 Studio version? Theme From Below Subset Unreleased live track ? Theme that started some of the Subset shows. What Can I Lick? Unreleased live track ? The Feelings Hijackers later recorded this track with another name "Letters From 3am" and new lyrics. TFH version is available on their debut album "T.F.H" and SupeRecord. What The Hell Extra Double Bonus Thrill Pack (Promo CD) ? Appeared as a bonus track on unreleased PUSA - Self titled (Extra Double Bonus Thrill Pack) promo release. Extra Double Bonus Thrill Pack was planned to be released on 2004, but it was later replaced by Ten Year Super Bonus Anniversary Edition, which had totally different bonus tracks.